Firming every body will love! Refreshing lotion — with an anti-wrinkle blend of Lemon Thyme, Centella and Bocoa extracts — helps improve skin’s natural elasticity for a sleeker, chicer silhouette. Firms, tones and helps promote youthful-looking contours to for younger looking skin. Toning body treatment oil formulated with 100% pure plant extracts to visibly firm, tone and improve elasticity. Rated 5 out of 5 by eirura from Super soft and smooth skin EVER This is the best body lotion hands down. I put this on top of my Body Fit lotion and oh my god, super soft and smooth skin. I couldn't stop touching my skin. I even made others touched my skin to feel how soft and smooth it is. The scent is super subtle and my skin absorbed the lotion and stays just as soft and smooth. It is also non-greasy so I can put on my clothes immediately after. Ok, let's move on to the firming, toning and lifting qualities of this product. This definitely tones and it does help with the firming but again I use it on top of the Body Fit lotion. They both work so well together. Rated 5 out of 5 by Lory from This really works! I've been using Clarins products for over 30 years but this was the first time I'd tried this lotion. My over 60 skin was needing some firming up for summer! I was delighted to find this lotion did a great job, leaving my skin firmer and better toned. I rarely write reviews but had to write this one! Rated 5 out of 5 by MandevilleMom from Love this lotion! I have finally found my new daily lotion! I use this after showering in the morning. Absorbs quickly and leaves the skin smooth and toned. Highly recommend. Rated 5 out of 5 by Sayo from Great lotion! Just started using this, looking forward to seeing the results. Rated 5 out of 5 by Joanne from extra firming lotion I love this lotion, it has a refreshing smell and really does a great job on the skin. Rated 5 out of 5 by bcbgsmommy from Another Clarins Winner! Yet another Clarins product that I LOVE! This body lotion is invigorating, and makes my skin so firm and soft. I am now addicted to this lotion, especially when I add a few drops of the Tonic Body Oil! Rated 5 out of 5 by Jackie from My Body Needs This I think we know how to care for our face but sometimes don't think about our bodies. 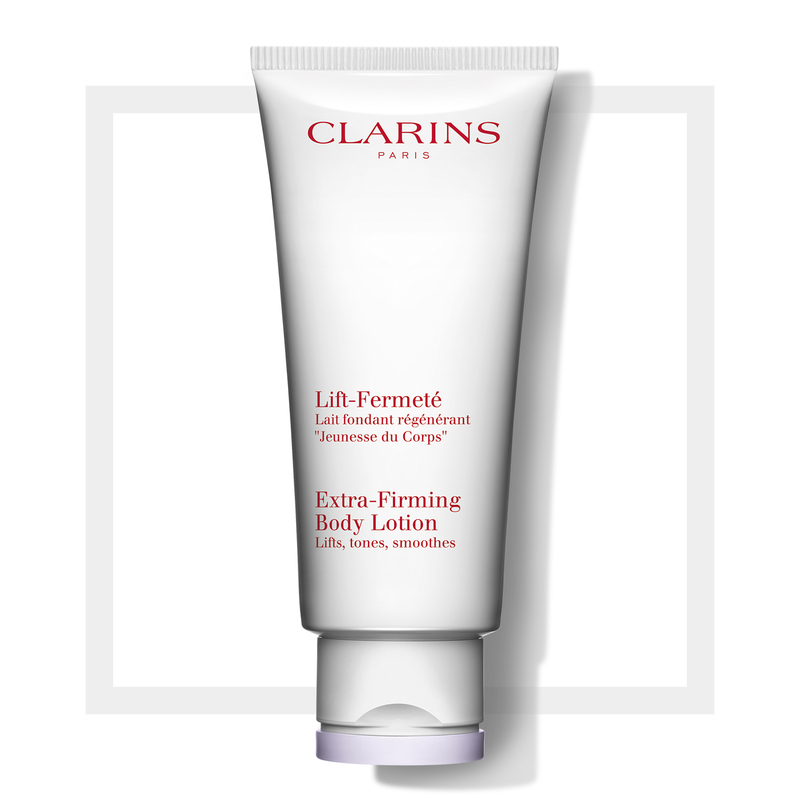 Since I started using Extra-Firming Body Lotion, I have noticed a difference even in these winter months. My skin looks more toned, more sleek, more supple. It brings attention to my body - stomach, neck arms and elbows. Of course my legs. This is the one I love. I recently have tried the Body Oil and love using them both together. Rated 4 out of 5 by CGNY from Very Expensive Lotion I'm an esthetician and a beauty product junkie, so I had to try this when it arrived at my local Bloomingdale's Clarins counter. First off, I love the smell and texture of the lotion, and my husband loved the smell too. It leaves your skin soft and very moisturized. However, I can't justify the $60.00 spend on a body lotion. I use body lotion every day on my whole body, so this tube did not last very long. I wound up cutting the tube open to make sure I got all of it out since it cost so much. I can't say that the lotion actually firmed my skin at all, but then I don't have particularly loose and sagging skin. For me I think the better bet is the Satin Smooth or Moisture Rich body lotions, both of which are very good.